Shop for authentic Iran Flags. 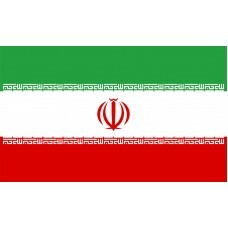 We offer indoor and outdoor Iran flags in durable nylon. Our outdoor flags are finished with a canvas heading, while indoor flags are finished with a lined pole hem and your choice of with or without fringe. We also offer indoor and outdoor Iran flag sets. 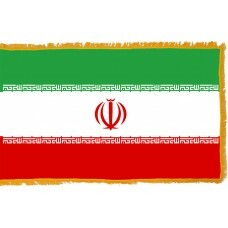 The flag of Iran is made up of three equal stripes of the colors green, white, and red. There is also a red centered National Emblem. The Takbir is written in Kufic script in white, a total of twenty-two times on the fringe of the stripes. This is split eleven times along the bottom edge of the green horizontal part of the flag and eleven times along the top edge of the red stripe. To mirror the changes impacted from the Iranian Revolution of 1979 this flag was adopted on July 29th, 1980. This flag replaced that of the Islamic Republic Persian Monarchy, under the leader Grand Ayatollah Ruhollah Khomeini with backing from some Islamist and leftist organizations. The red centered emblem tulip shape design is a memorial to those who have died for Iran, symbolizing the patriotic value and self-sacrifice, from the legend that red tulips mature from the martyr's bloodshed. The emblem is highly complex in design, using words and phrases to form the crescents for the tulip shape. The flag is non-reversible due to the Kufic script which is symbolic of the calls of Allahu Akbar on February 11th, 1979 when it was broadcast on the national radio, "From Tehran, the voice of the Islamic Republic of Iran" marking the unofficial start of the Islamic Republic. The green color of the flag is representative of happiness, growth, unity, nature, vitality, and the Persian language in Iranian culture. The white is the traditional color for freedom. The red is symbolic of martyrdom as well as being representative of fire, love, life, bravery, warmth, and sophistication. Iran has had a turbulent history of war and peace and thus many flags have been flown in this country. A well-known flag in use up until the revolution of 1979 was a tricolor green, white, and red flag with a Lion and sun motif superimposed onto it. The new Iranian government looked upon the Lion and sun emblem as a symbol of "oppressive westernizing monarchy" so it was replaced on the new version of the flag and the Red Crescent Society was the new name that took the place of The Red Lion and Sun Society. Communities in exile are presently using the lion and sun flag as a symbol of defiance against the Islamic Republic. Monarchists and some other political organizations continue to use it as well. The oldest flag used to represent Iran featured a seated man opposite a kneeling woman and a black star in between. There are numerous other designs used throughout the reigns of the different empires, including a leather and silk jewel encrusted flag showing a four-pointed center star in Sassanid times. Griffin and checkered motifs appeared on banners in the Ghaznavid dynasty, which was a Turkic dynasty devoted to Iranian culture promotion. In cities in California such as Los Angeles that have sizable expatriate communities you can see the noticeable lion and sun markings on souvenirs and flags. The capital of Iran is Tehran, which is also the most populous city in Western Asia.